GoPro Cameras: How Wet Can It Get? One of the main reasons to buy a GoPro is to be able to take it into the sloppiest of conditions with little worry. You didn’t have that choice with other camcorders. Taking a conventional camcorder through a swamp or shooting upward during a torrential rainstorm isn’t in that device’s best interest. Chances are that you’d burn it out. Most conventional cameras — especially the electronic ones — don’t like the wet stuff. Being able to go underwater makes the GoPro is as refreshing as a cold glass of water or a swimming pool on a hot summer day — and you can adequately capture each of those locations from the inside out. Isn’t it nice to have a camera that has the same tolerance for wet conditions as your diver’s wristwatch? Feel free to get it wet. Just don’t take it in your bathtub without the waterproof housing, and make sure you don’t have the Skeleton backdoor on. That one’s not waterproof. How deep can the GoPro get? Two backdoors come with your GoPro: Skeleton, which provides good sound quality, and Standard, which is waterproof. Make sure that you have the Standard backdoor on when you use the GoPro underwater, because the Skeleton isn’t waterproof. 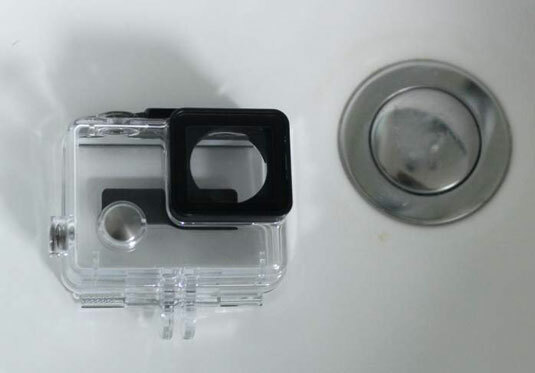 Dive Housing: This accessory increases the GoPro’s depth rating to 197 feet (60 meters). Touch BacPac Backdoor: There’s a trade-off with this accessory. Although it lets you monitor the scene from the camera back, you can’t use it deeper than 10 feet (3 meters). Have enough room on the card: Remember, if you run out of storage, you can’t change cards in the water. Make sure it’s clean: Not only do they say it’s next to godliness, but keeping the glass in front of the lens clean will assure you capture clear and sharp images. Test the case: A test case case? Why not? Yeah. It’s waterproof, but isn’t nice to be reassured? So without the GoPro inside, close it up and submerge in water, as seen in this figure. After a brief soak, dry the outside completely before opening and see if it’s wet inside. Make sure the camera is fully sealed: Push the housing backdoor all the way in before securing the black latch on the top of the case. Rinse off salt water: If you’re going to take it to the beach, on a dive, or any situation involving salt water, it’s always a good idea to safely remove the camera and wash the housing with fresh cool water. The salt can get caught in the case and around the lens, causing rust on the metal parts and a salty coating over the lens.